This is the first major work from McGarryBowen since being hired last year. American Express has unveiled a new global initiative aimed at uniting its consumer and business customer segments under one shared message. The message: "American Express has your back to help you build your business and get the most out of life." According to a study conducted by the brand, the majority of people today are living blended lives, with personal and work life deeply intertwined. The research, which was conducted in eight countries around the world, including Australia, Canada, Hong Kong, India, Japan, Mexico, the United Kingdom and the United States, also revealed that two in three people feel the work-life integration helps them achieve more. "At its core, our new brand platform reinforces our relationship with our customers and that American Express is there to support them in ways big and small," said Elizabeth Rutledge, CMO at American Express. "While we have always been known as a relationship company, who we serve has evolved. Many people think of American Express as a consumer brand, but nearly 40 percent of our business comes from other businesses today -- from start-ups and entrepreneurs, to mid-size businesses, to Fortune 500 companies," Rutledge added. The new ad campaign, called "Powerful Backing: Don’t Do Business / Don’t Live Life Without It," was created by McGarryBowen, Pentagram, Ogilvy, Mindshare and Digitas. 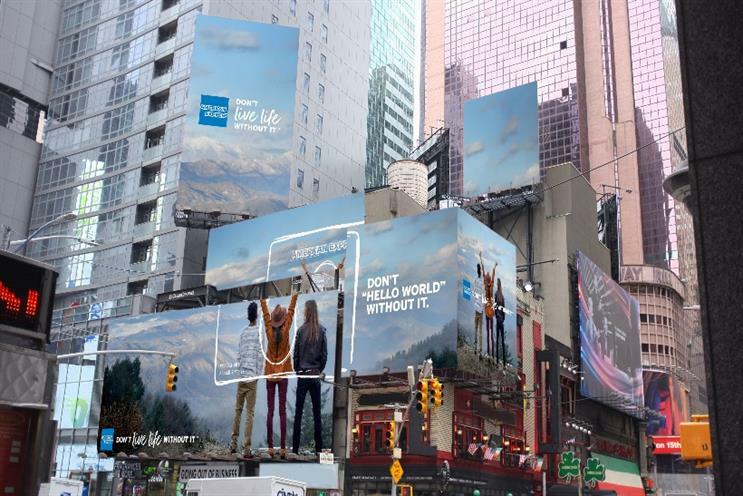 The 360-degree coverage includes TV spots and an OOH drive in major transit hubs and throughways in New York, Los Angeles, Chicago and San Francisco. In May, the company will donate some of these units to local artists. The company will also run contextually relevant ads on "geo-aware" taxi tops that change content based on the neighborhoods the taxis are driving through. This is the first major work from McGarryBowen for American Express since winning the account last year. The brand spent more than $500 million on paid media in 2016.